The time finally came for Jacob to move to his big boy car seat! We set it up in the living room and let him have a sit in it and he looked so proud just sitting in it and smiling away. 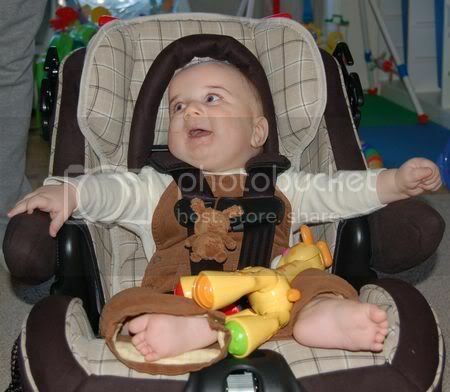 I feel a mixed array of emotions at this graduation (as I suspect I will feel at future graduations) but I remember this tiny being I brought him from the hospital – he was so small he needed inserts on each side of the car seat to help him sit in it properly – his tiny feet didn’t even come to where the buckle began…and now he’s in this seat, sitting fully upright, arms on the arm rests and smiling up at us – as if to say thanks Mom and Dad – the view from this seat is a WHOLE lot better. I miss the small dependent Jacob – who just spent hours in my arms cradled and calm – but I’m amazed and so much in love with the Jacob I have now – the crawling, squealing, laughing, smiling, trusting, and less dependent little boy who at this moment is softly dreaming in his room. Somedays I want newborn Jacob back but on days like yesterday – watching him sit upright in that seat – my love for him swelled like it had never before – I wanted to understand him – to know the thoughts he was thinking at that moment. I look into his eyes and I see wonder, amazement, fascination and I wish I could be in his eyes – experiencing it the way he does…but I will settle for watching him explore life.